If you are anything like most people in this world, bugs gross you out. You can stand them as long as they do not invade your personal space. Once they have gotten into your home, you want to get them out as quickly as you can. Sure, there are a lot of products on the market to help you get rid of bugs, but, unfortunately, a lot of them are not effective, and may contain toxic fumes that are not safe for people and pets. If you have an issue with bugs and need to turn to extermination professionals, look no further than Eco Tech. Serving Minneapolis, MN, with over fifty years of combined experience, this family owned company has seen it all! Not only can we get rid of your bug issues currently, but we can also protect your home from any bugs in the future. What sets Eco Tech apart from the competition is that we practice organic bug extermination. We pride ourselves in providing customers with humane ways to get rid of unwanted bugs. Additionally, the products that we use do not harm humans or pets. Beetle Extermination – There are different types of beetles that can be found, and reproduction is something they excel in. 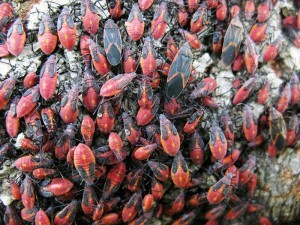 If not maintained, these beetles can breed and become a huge problem for your home. Each beetle type reacts differently to various bug controls, so it is important that a professional identify the particular type that you are dealing with in your home. Spider Extermination – These critters can be scary and dangerous! If you are having insect issues, there is a good chance that you also have spiders because they feed on the bugs that you are finding. Our team of professionals can decipher the species of spider and remove them from your home. Ant Extermination – A problem we all have more than likely faced in our lifetime. These ants can roam almost anywhere. An ant colony is gigantic and can number up to 500,000. They are eager to find food leftovers, so keeping your home clean is vital in prevention. Our experts can locate the nest and get rid of all of the ants. If you are in the Minneapolis, MN area, give Eco Tech a call today at (763) 785-1414, before even more bugs invade your home!